The much-awaited Ajith's full video song is out! Festive release Viswasam starring Thala Ajith in the lead was directed by Siva and it is the 4th time the actor has joined hands with Siva in a row for a film. 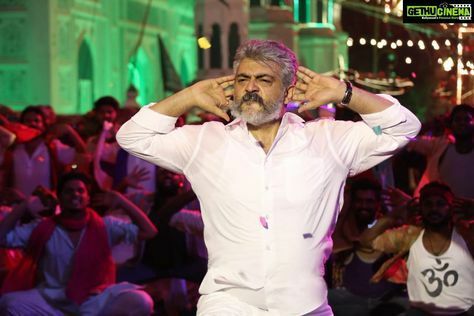 The duo have delivered massive blockbuster hits previously such as Veeram and Vedalam and the two are back once again delivering one of the biggest blockbuster hits in Ajith's career with this Pongal release titled Viswasam. The film had Thala Ajith share screen space with actress Nayanthara and it was also the 4th time the two stars came together for a film. The film has gathered a massive response from the audience and it has for sure been a visual treat for all the Thala fans. The film has done extremely well in different parts of the world and is highly talked about even two weeks after the release of the film. This film is produced by Sathya Jyothi Films and the tunes were composed by ace music director D. Imman. The team earlier announced that they will be releasing the video song of one of the most popular numbers in the album titled 'Adchithooku'. The fans have been eagerly awaiting this release to watch Thala Ajith's dance in this special number! The wait is over and here is the official full video of Adchithooku. Click below to watch this fantastic number!